A bacteriophage (from ‘bacteria’ and Greek ‘phagein’ “to eat”) is any one of a number of viruses that infect bacteria. The term is commonly used in its shortened form, phage. 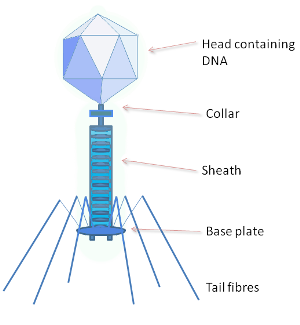 Typically, bacteriophages consist of an outer protein hull enclosing genetic material. The genetic material can be ssRNA (single stranded RNA), dsRNA, ssDNA, or dsDNA between 5 and 505610 kilo base pairs long with either circular or linear arrangement. Bacteriophages are much smaller than the bacteria they destroy – usually between 20 and 200 nm in size. Phages are estimated to be the most widely distributed and diverse entities in the biosphere. 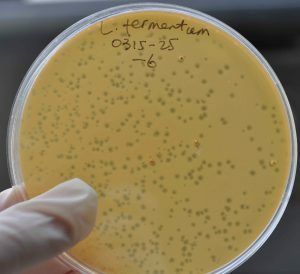 Phages are ubiquitous and can be found in all reservoirs populated by bacterial hosts, such as soil or the intestines of animals. One of the densest natural sources for phages and other viruses is sea water, where up to 9×108 virions per milliliter have been found in microbial mats at the surface, and up to 70% of marine bacteria may be infected by phages. They have been used for over 60 years as an alternative to antibiotics in the former Soviet Union and Eastern Europe. They are seen as a possible therapy against multi drug resistant strains of many bacteria. Mc Grath S and van Sinderen D (editors). (2007). Bacteriophage: Genetics and Molecular Biology, 1st ed., Caister Academic Press. ISBN 978-1-904455-14-1 . Wommack KE, Colwell RR (March 2000). “Virioplankton: viruses in aquatic ecosystems”. Microbiol. Mol. Biol. Rev. 64 (1): 69ñ114. PMID 10704475.